Your Dentist in Danville Joins You in the Fight Against Oral Cancer! April has been designated as Oral Cancer Awareness Month in an attempt to draw attention to a condition that over 40,000 Americans are diagnosed with annually. By raising awareness, dentists across the country are aiming to reverse what has become an alarmingly growing trend of diagnoses. As you continue reading, your dentist in Danville will explain how semi-annual visits and other simple habits serve as major tools in preventing the growth of this disease. 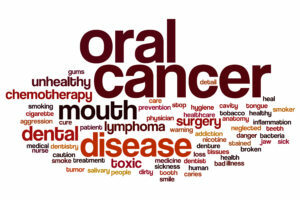 Oral cancer is the uncontrollable growth of abnormal cells in your mouth or throat that cause unhealthy mutations. Mouth – The cancer growth in your oral cavity affects your lips, the inside of your cheeks, teeth, gums. It can also affect the front two-thirds of your tongue, the floor and roof of your mouth. Throat – The kind found in your throat affects the middle region, which includes your tonsils, and also the base of your tongue. It’s quite refreshing to know that there are certain practices and behaviors that, when properly conducted, can serve as a major protection against acquiring oral cancer. Consistent Oral Hygiene – One of the contributors to oral cancer is bacteria growth, which can be controlled through practicing excellent oral hygiene. The two main methods that should be part of your cleaning routine are brushing and flossing at least two times a day. Avoid Harmful Activities – Another way to protect yourself from oral cancer is to avoid harmful activities like smoking or chewing tobacco and excessive alcohol consumption. Regular Visits to Your Dentist – Your dentist is a great asset in your fight against oral cancer. So be sure to maintain semi-annual visits for cleanings and checkups. While there, he’ll perform an oral cancer screening in addition to removing any built-up plaque and tartar. Furthermore, if signs of its presence are found, your dentist will have more options to treat the disease because of its early detection. Thus, there’s no time like the present to take the proactive approach to your oral health, so reach out to your local dentist to schedule an appointment today! First inspired to become a dentist through a high school dental assisting program, Dr. Thomas J. White would later go on to earn his Doctor of Dental Surgery degree from the Virginia Commonwealth University School of Dentistry. Since then, he has gone on to provide expert and compassionate care to his patients at Danville Dental Associates. Dr. White can be reached for more information through his website. Comments Off on Your Dentist in Danville Joins You in the Fight Against Oral Cancer!